Yamicsoft Software Vista Manager – The Best Tuning and Optimizing Utility for Windows Vista! Windows Vista is the new Operating System for home users and professionals alike. Windows Vista brings clarity to your world, so you can more safely and easily accomplish everyday tasks and instantly find what you want on your PC. 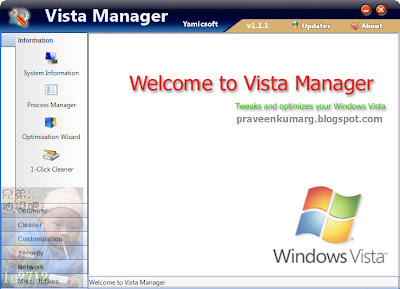 Vista Manager is the powerful software, All-in-One utility to optimize, tweak, tune up and clean up your Windows Vista. It bundles more than 20 different utilities in one! Get access to hundreds of hidden options to improve system’s performance and security, clean registry, junk files and defrag Registry, optimize network to speed connection, Mange the startup entries with Windows, change wallpaper automatically, and many other miscellaneous utilities. It is an excellent companion for Windows Vista.